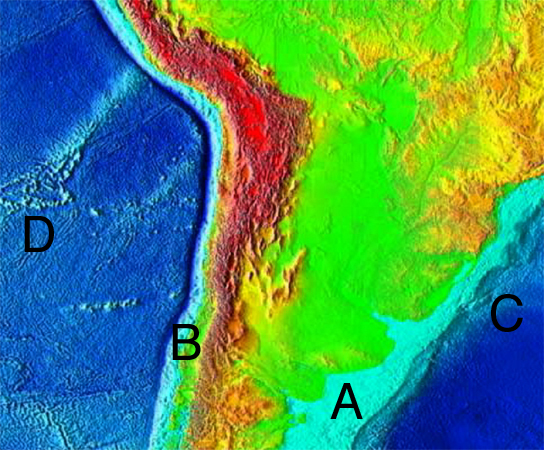 Image of a portion of the South American continent and the nearby oceans. Colors indicate land surface elevations and water depth. Letters A-D indicate locations corresponding to answers to ConcepTest questions. 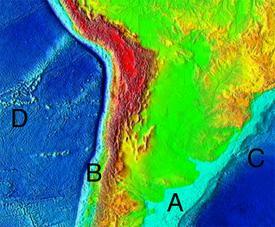 Image courtesy the National Geophysical Data Center. ConcepTests are conceptual multiple-choice questions that focus on one key concept of an instructor's learning goals for a lesson. When coupled with student interaction through peer instruction, ConcepTests represent a rapid method of formative assessment of student understanding. ConcepTests are products of a teaching strategy known as peer instruction that was initially developed to provide a mechanism for introducing effective active learning strategies into physics lecture classes without having to make acute changes to course content or organization (Mazur, 1997 ). The use of conceptests has proved successful in enhancing student learning, improving student satisfaction with course and/or instructor, and increasing student attendance. Further, the teaching strategies used in the implementation of ConcepTests and peer instruction mirror the principles of good practice in undergraduate education. Peer instruction introduces the use of conceptual multiple choice questions, ConcepTests, that are initially analyzed by students working alone, and then in a pair or a small group. The effective use of ConcepTests follows a simple five-step protocol that can be readily shortened by instructors to meet the needs of their specific classes. Instructors should also give some thought to how ConcepTests will be assessed in class. We recommend some formative assessment strategies that encourage participation and attendance in a low-stakes learning environments. ConcepTests can be used with or without electronic response systems ("clickers"). Questions that seek to probe a student's comprehension or application of a concept often make ideal ConcepTests. Comprehension might involve making a prediction of what would happen in an experiment or how changing one variable would affect others. Application often involves applying rules or principles to new situations or using known procedures to solve problems. Questions that ask students to solve a problem using a known equation or to select a procedure to complete a new task would be considered application questions. 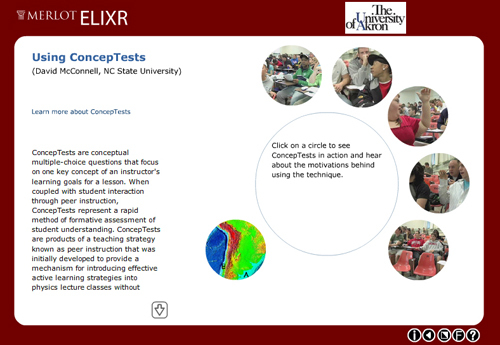 In conjunction with the Merlot Elixr project, a series of short videos have been put together showing Dr. McConnell using ConcepTests in his classroom as well as answering questions about the technique. Check out this great additional resource.